If you are on the hunt for a Herefordshire Wedding Venue right now, then congratulations! Herefordshire has so many lovely wedding venues, it may seem a daunting (although exciting) task ahead to choose the one that’s right for your wedding day. Being a local wedding photographer, I know all the loveliest wedding venues very well, so in this series I am aiming to help you find your venue, with the use of pictures. Today I’m showing you Lyde Court in Herefordshire – probably the nearest wedding venue to my own home, being only 10 minutes away! If you are looking for a wedding photographer too, please do take a look at my website when you’ve read about Lyde Court. Lyde Court is a stone barn wedding venue with ceremonies outside and inside being possible. The barns date from the 17th Century, and are completely unspoilt, with stone walls, vaulted ceilings, beams, galleries and arrow-slit windows. It all makes for a very rustic and atmospheric setting! Especially when you add in candles, mismatched antique furniture, and all your own decorations that you would like to add to your wedding day styling. The gardens of the house itself are available for photographs, and the fields all around give fantastic views over the Herefordshire countryside. There are other barns and an oast house as well as the main house too. It’s amazing to think you are only 2 miles from the centre of Hereford, in this idyllic rural hideaway. 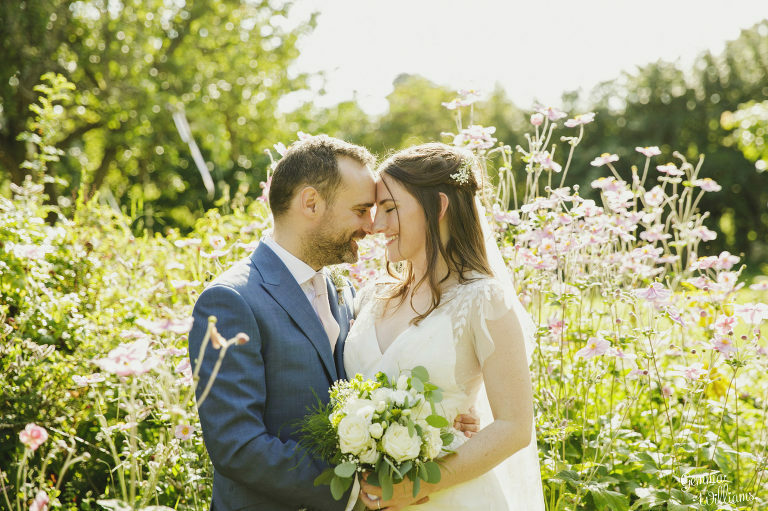 Gary and the team at Lyde Court give you huge flexibility to create your own wedding day however you want and are always on hand to help – if you are interested to find out more you can contact them here. Bridal prep before the ceremony is possible at Lyde Court in the main house. There is a dedicated room downstairs for this, the White Room, as well as a Bridal Suite upstairs, which provides ample space for getting ready. I particularly love the natural window light in the White Drawing Room. You are tucked away here so guests and the groom won’t accidentally see you before the ceremony, and it is only a short walk to your ceremony when it’s time. Lyde Court provides an amazing opportunity to get married outside, in a choice of two beautiful locations. Seating for your guests is set up on the grass on The Willow Lawn or The Rose Lawn outside the barns, and your ceremony is conducted at the barn opening. Performing your marriage ceremony under the barn structure in this way means that it is legally binding, so there’s no need to go elsewhere to complete the formalities. Wedding ceremonies indoors can be held in the barns (this also gives a plan B in case it is raining on the day of your outdoor ceremony). You are free to decorate the barns however you wish, and the ancient stone walls, beams, and candles make a very romantic atmosphere. The White Room in the main house may also be used for very small ceremonies. Alternatively, you may wish to have your wedding ceremony in a church nearby, and arrive at Lyde Court for your reception afterwards. At Lyde Court you can throw biodegradable confetti where-ever you like! You may like to throw it after your outdoor ceremony as you walk down the aisle, or as you go to your reception across the lawn. The organisers at Lyde Court are very good and will help you plan this in. Lyde Court has great spaces for your wedding reception come rain or shine! If it is raining, guests can mingle in the bar area of the barn, where there are sofas downstairs and some more seating upstairs too. If it’s a nice day, guests can mingle on the lawns, both by the barns and by the house. There are opportunities for garden games and other entertainment as drinks and canapes are brought round. There are also fire pits and picnic tables outside to use. Make the most of mingling and chatting with all your guests at this time – it’s the best way to get lots of natural photographs too! Lyde Court has lots of lovely photo spots we can use – surrounded by countryside, there are beautiful views all around. There is also a secret garden and lots of flowers and trees, including a stunning wisteria at the right time of year. I love the rustic backdrop the stone barns and wooden doors provide, and a short hop into the fields gives even more opportunity for amazing photographs. This is why I love shooting here! I am very happy to spend as much or as little time on your ‘formal’ photographs as you wish, and I like to keep them as ‘informal’, natural and relaxed as possible, so that you look back and see the real you enjoying your wedding day. Your wedding breakfast is provided in the Great Barn, and is catered by Lyde Court’s own team. I always think that the barn set for wedding breakfast is a stunning sight. You can choose to have round tables or long banqueting tables, and you are free to put your top table wherever you would like it best. There’s also an unbelievable selection of vintage chairs to either match or mis-match, giving the barn a really original and quirky look. You can add your own decorations, bunting, fairy lights, flowers etc to make it look amazing. Lit by candles, it really is a most atmospheric dining experience for your guests. Your band or DJ can set up on the stage at one end of the Great Barn, and there is a dancefloor area here with plenty of room for crazy shapes. Lyde Court has a great PA and lighting system, so you’ll be able to party until you drop! You can also check out my Lyde Court Pinterest Board for more ideas. Gemma Williams is an award-winning Wedding Photographer and Family Photographer based in Herefordshire in the West Midlands, UK.